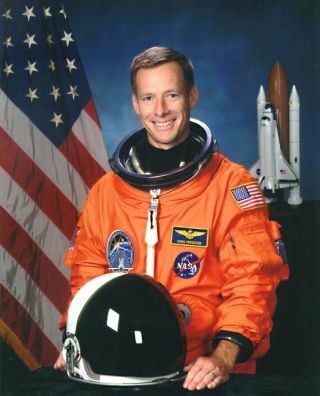 NASA astronaut and shuttle pilot Chris Ferguson poses for a preflight portrait. PERSONAL DATA: Born September 1, 1961 inPhiladelphia, Pennsylvania. Married to the former Sandra A. Cabot. They havethree children. Recreational interests include golf, woodworking, running, andhe plays drums for Max Q, a rock and roll band. His mother, Mary Ann Pietrasand stepfather, Norman Pietras, reside in Langhorn, Pennsylvania. Sandra'smother, Trudy, resides in Norristown, PA.
EDUCATION: Graduated from Archbishop Ryan HighSchool, Philadelphia, Pennsylvania, 1979; received a bachelor of science degreein Mechanical Engineering from Drexel University, 1984 and a master of sciencein Aeronautical Engineering from the Naval Postgraduate School, 1991. ORGANIZATIONS: Society of Experimental Test Pilots. AWARDS: Navy Strike/Flight Air Medal, NavyCommendation Medal (3), Navy Achievement Medal, and various other serviceawards/citations. EXPERIENCE: Ferguson was commissioned from theNROTC program after completion of a 5-year cooperative education curriculum atDrexel University. He was temporarily assigned to the Naval Test PilotSchool at Naval Air Station (NAS) Patuxent River, Maryland prior to commencingflight school in Pensacola, Florida in November 1984. Following flight trainingin Florida and Texas, he received his Navy wings and was ordered to the F-14replacement training squadron in Virginia Beach, Virginia, where, after a ninemonth period of instruction, he joined the 'Red Rippers' of VF-11. With VF-11 he made deployments to the North Atlantic,Mediterranean and Indian Ocean on board the USS Forrestal (CV-59). While withVF-11 he also attended the Navy Fighter Weapon School (TOPGUN). He was selectedfor the Naval Postgraduate/Test Pilot School program in 1989 and graduated withclass 101. From July 1992 through June 1994 he was assigned tothe Ordnance Branch of the Strike Aircraft Test Directorate at NAS PatuxentRiver. There he served as the project officer for the F-14D weapon separationprogram where he became the first to release numerous air-to-ground stores fromboth the A and D model of the Tomcat. In July 1994, he was chosen to instruct at the NavalTest Pilot School which he did so until July 1995. After a brief retrainingperiod he joined the 'Checkmates' of VF-211 where he completed a deployment tothe Western Pacific/Persian Gulf aboard the Nimitz (CVN-68) in supportOperation Southern Watch and contingency operations off the coast of Taiwan. Hebriefly served as the F-14 Class Desk Officer for the Commander Naval AirForce, Atlantic Fleet prior to his selection to the space program. NASA EXPERIENCE: Selected by NASA in June 1998, Ferguson reported tothe Johnson Space Center in August 1998. Following the completion of two years of training andevaluation, he was assigned technical duties in the Astronaut Office SpacecraftSystems/Operations Branch involving the Shuttle Main Engine, ExternalTank, Solid Rocket Boosters and Shuttle Software. Ferguson is assigned as Piloton STS-115. The mission is targeted to launch in 2006.